The Spectrem Affluent Investor Confidence Index (SAICI®) gained three points in January to 8, a reflection of an increasingly bullish mindset among Affluent investors as market indices reached new highs. Since 2004, the monthly Spectrem Affluent Investor Confidence Indices have tracked changes in investment sentiment among the 16.3MM households in America with more than $500,000 of investable assets (SAICI), and those with $1MM or more (SMICI). This month’s survey was fielded between January 17-23, 2017, when the Dow Jones industrial average was poised to reach 20,000 for the first time (it would reach that benchmark on Jan. 25). The Spectrem Millionaire Investor Confidence Index (SMICI®) stood at 12, which was unchanged from December. 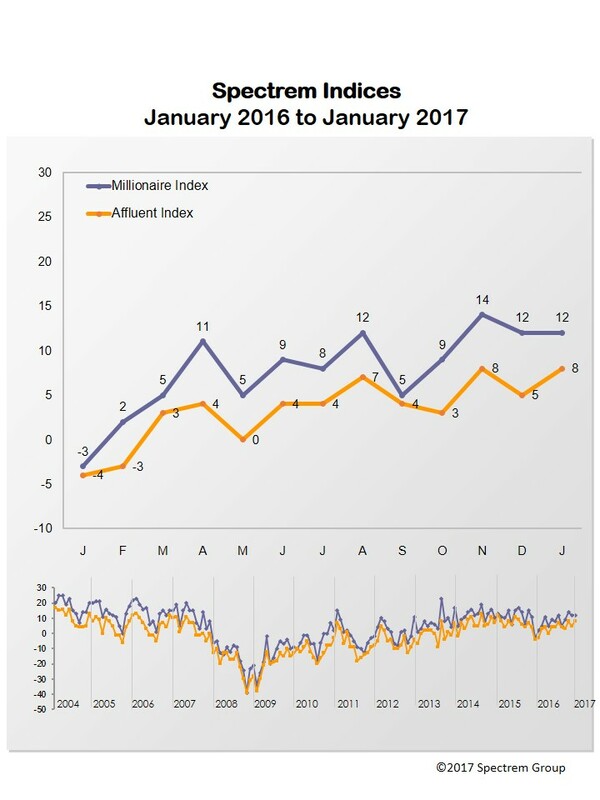 While the confidence level among Millionaire investors did not increase in January, the index is still in mildly bullish territory, an indication of cautious optimism. Both Spectrem indices are significantly higher than they were during the same period last year. The SAICI has gained 12 points year-over-year, while the SMICI has gained 11. One of the drivers of the Affluent investor confidence indices is a monthly survey conducted by Spectrem Group in which Affluent investors are asked how they intend to invest in the coming month. How has the more than two-month (and counting) rally impacted the investment mindset of Affluent investors? Intention to invest in equities is at a 16-month high, the survey found. And while 38 percent did indicate they would hold on the investment sidelines, this was an almost 4 percentage point decrease in those who answered similarly in December. Another driver of the indices is the Spectrem Affluent Household Outlook, a monthly measure of four financial factors that impact Affluent households’ daily lives. The January Outlook is at 26 pts; a dip of 1.30 points from December, but up 23.5 points from January 2016. Confidence in the Economy is at an 18-month high, while the other Outlook components—Household Assets, Household Income and Company Health—are up from the same period a year ago. The Outlook for non-Millionaires lags behind that of Millionaires, but the gap narrowed in January. The non-Millionaire Outlook is at 21.24 points, a 20-month high. In comparison, the Millionaire Outlook is at 29.23 points.